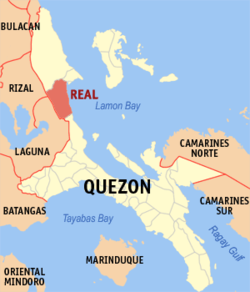 Real, officially the Municipality of Real, (Tagalog: Bayan ng Real), is a 1st class municipality in the province of Quezon, Philippines. According to the 2015 census, it has a population of 35,979 people. This coastal town, located on the eastern shores of Luzon facing the Philippine Sea, is noted for its rural beach resorts. Real is a small town facing the Pacific Ocean, approximately 133 kilometres (83 mi) from the Quezon capital Lucena City and 145 kilometres (90 mi) from Manila. Real has 17 barangays: 14 rural and 3 urban. Its total land area is 563.8 km², the second largest in the province. Tourist spots include zigzag road views, Balagbag Falls, river scenery, and Baluti Island. Its beaches also attract tourists during summer time. Barangays Tignoan and Malapad are also known for surfing. Real is politically subdivided into 17 barangays. Spanish forces landed at the site of Real early in the colonization period, calling it Puerto Real. Spanish galleons and ships docked at the port reinforced forces stationed at the nearby place "Binangonan del Ampon" known now as Infanta. Formerly a barrio of Infanta, Real was created into a municipal district with a set of government comprising the barrios of Llavac, Cawayan, Capalong, Tignoan, Kiloloron, Lubayat and Pandan which were all segregated from the mothertown of Infanta. This was by the virtue of Executive Order No. 410 dated December 15, 1960, by President Carlos P. Garcia. In November 29, 2004, Real was hit hard by Typhoons Winnie, Violeta, and Yoyong. About 500 people were either killed or missing. ^ Ventura, Anika. "Classes. More Fun in the Philippines". It's More Fun in the Philippines. Philippine Department of Tourism. Retrieved 26 November 2015. 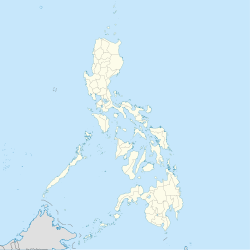 Wikimedia Commons has media related to Real, Quezon.